Air-Conditioned Lounge: Protection from heat, humidity, rain-storms and insects. 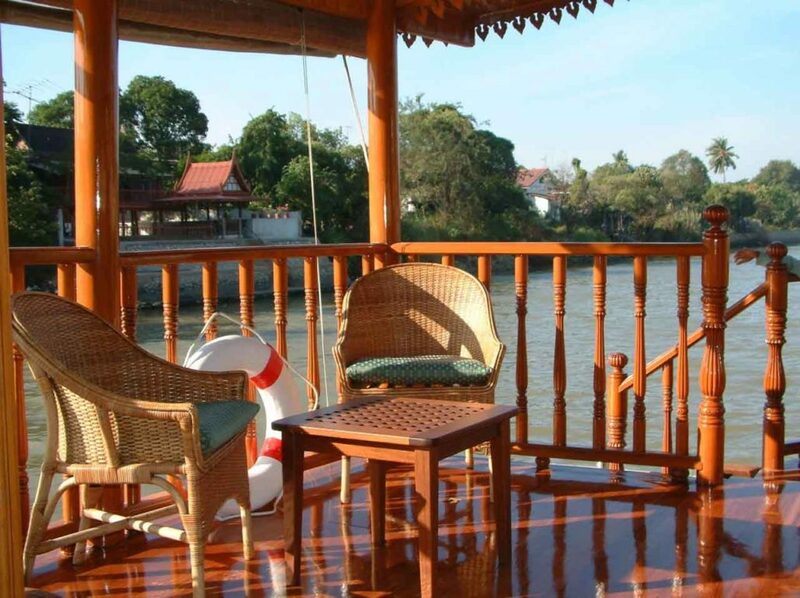 Shady Verandah Deck: Enjoy the scenery without the tropical sun. 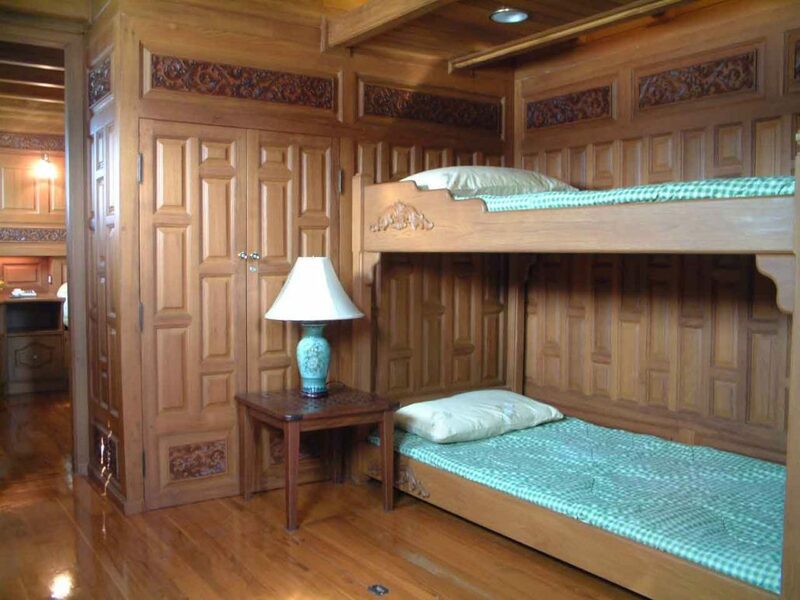 Luxurious Stateroom: Extends the full width of the boat and features solid teak paneling, king-sized bed & full amenities. En-suite Bathrooms: Fully featured, with granite floors and vanity, stained glass windows. Integrated Entertainment System: Home Theatres in the lounge & stateroom. Complimentary Wi-Fi / Ethernet / Bluetooth internet-connected audio/video throughout. 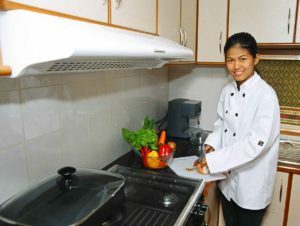 Fully Equipped Kitchen: Modern Western style kitchen with full range of appliances. Solid Golden Teak Paneling & Fixtures: ‘Montar’ is the only barge having 100% solid teak, from floor to ceiling, throughout. The lounge and dining areas: designed like a garden pavilion with light, ornate, teak balustrade, afford uninterrupted views of the river. The decorative teak ceiling features a traditional ceiling fan to supplement the river breezes, adding to the tropical Old-World atmosphere. 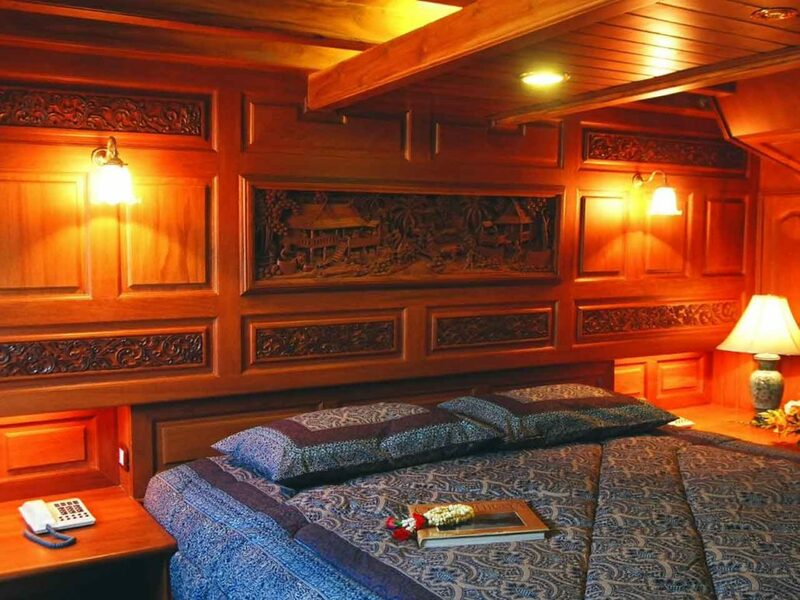 Solid teak traditional panelling includes a high relief teak carving depicting a scene from the Ayutthaya period. When required, closing the discreet but extensive windows reveals the lounge-dining area to be in fact a glass walled room. This unique feature of ‘Montar’ not only protects guests from the omnipresent mosquitos and other occasional nuisance insects, but also allows the modern air-conditioning system to provide comfortable climate control during the monsoon season. Cane furniture and carefully selected drapes complement the decor, giving an intimate, homely atmosphere. Sliding glass doors provide access to the Front Verandah Deck; this area is protected from sun and rain whilst allowing close contact with the life along the river and its ever-changing scenery. 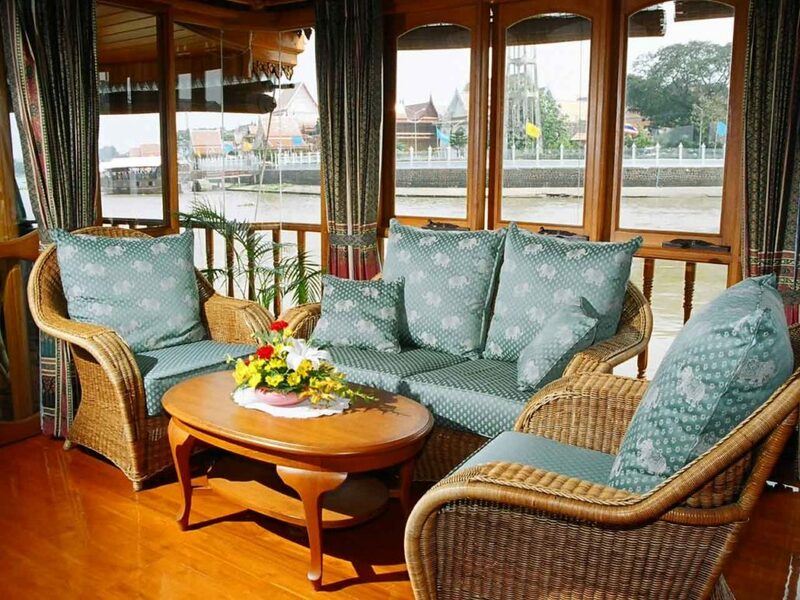 Here is a restful spot to enjoy breakfast, afternoon tea, evening cocktails, or simply to laze in the teak ‘steamer’ deck-chairs and watch the passing parade. Below decks, the Master Stateroom continues the teak decor, with the paneling reflecting the original barge construction. Hand-carved, solid teak doors and a high relief teak carving above the bed-head, gives the room an old world feeling of comfort and luxury. This spacious room stretches the full width of the barge and features a king size bed and elliptical windows that frame the river views. 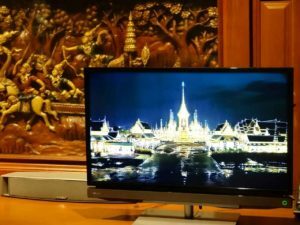 remote control air-conditioning, generous cupboards, telephones, television, 5.1 surround sound, High Definition BlueRay home theatre, and a safety deposit box. 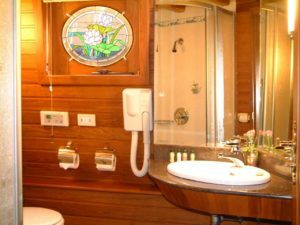 Opening off the stateroom is an En-suite Bathroom with shower, hand basin, toilet, hair drier and international shaver outlet. It features a lead-light, stained glass window, Art Deco light fittings and ‘pink marbled’ black-granite floor and vanity. Aft of the stateroom, a multi-purpose saloon, also with a full en-suite, provides additional accommodation or luggage storage for groups; enhancing the flexibility in usage of the vessel. The barge has a state of the art Integrated, Entertainment System throughout; which includes: a dual-zone sound system on the upper deck, featuring streaming from personal devices, ‘Spotify’, karaoke, 5.1 home theatre, television, Sonos digital player, music server, internet radio, DVD etc. 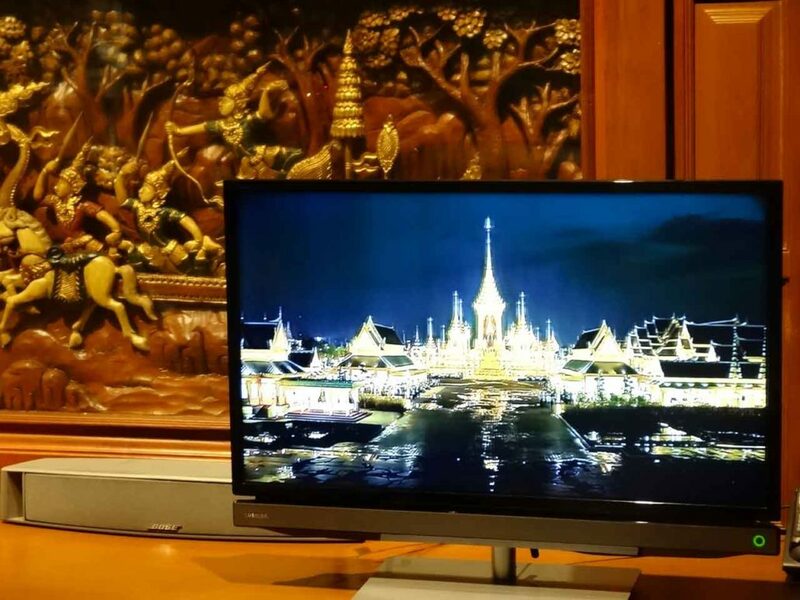 The stateroom has 5.1 home theatre, BlueRay player, television and music from the main music server system. A fully equipped kitchen located on the mezzanine deck, towards the vessel’s stern, features a wide oven, microwave, deep fry, coffee machine, bread-maker etc. A deep freezer and large ice-box on the aft deck completes a very capable catering facility. We also carry a wide range of fine glassware and exotic, hand-painted crockery. 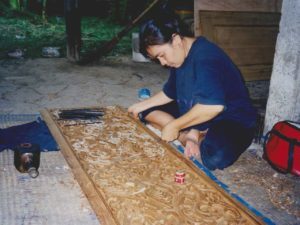 ‘Montar’ is Solid Golden Teak throughout. The 2.5cm (1”) decking and 100X150cm (6”X4”) deck beams are from commercial teak forest thinning; ‘A’ grade commercial teak was used for the remainder. The wall panels were machined on site, the hand carved door panels and decorative wall panels were crafted in Ayutthaya, the high relief wall feature panels were carved in Chiang Mai, commercial teak lining boards and decorative balusters make up the remainder. “Montar’ is licensed by the Marine Department as a passenger-carrying vessel for up to 20 guests and also licensed as a floating restaurant. Her elegance, comfort and flexibility, make ‘Montar’ equally suitable for sightseeing, business entertainment, family holiday or for special occasions. 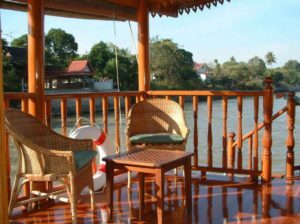 Together with the exotic scenery, makes ‘Montar’ the most comfortable and elegant living or entertaining venue on the river.